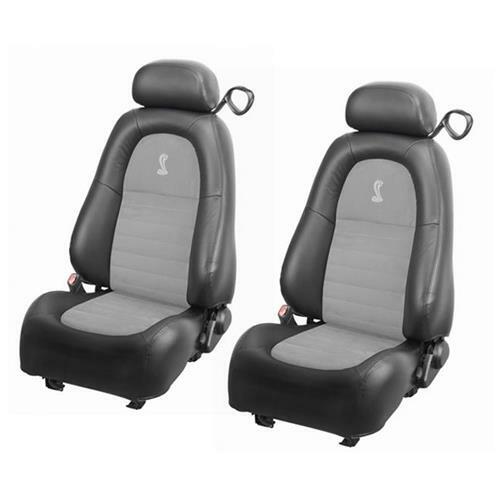 Replace your worn out Mustang front seat upholstery with this TMI 2001 Cobra medium graphite seat upholstery kit! Restore the interior of your 2001 Cobra with this front seat upholstery kit! 99% of the time the only seats that get worn in a Mustang are the front seats. This seat upholstery kit replaces both the driver and passenger side front seats. The upholstery is patterned from the original seats for an OE style fit and finish. This reproduction Cobra front seat upholstery is intended for 2001 Mustang Cobra seats. The upholstery features dark charcoal vinyl back and sides with Medium Graphite Unisuede inserts. While the factory insert material is Alcantara, Unisuede is a high quality material that almost identically matches Alcantara at a fraction of the cost. The seats have the Cobra snake logo embroidered into the seat backs for a factory look. While you can re-use your existing seat foam, we highly recommend replacing it with new foam.